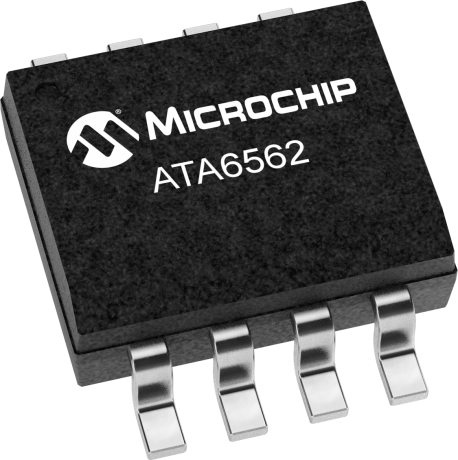 The Microchip ATA6562 is a high-speed CAN FD CAN transceiver that provides an interface between a controller area network (CAN) protocol controller and the physical two-wire CAN bus. The transceiver is designed for high-speed (up to 5Mbit/s) CAN applications in the automotive industry, providing differential transmit and receive capability to (a microcontroller with) a CAN protocol controller. It offers improved electromagnetic compatibility (EMC) and electrostatic discharge (ESD) performance and ideal passive behavior to the CAN bus when the supply voltage is off. Three operating modes (Standby, Normal and Silent Mode) together with the dedicated fail-safe features make the Microchip ATA6562 an excellent choice for all types of high- speed CAN networks, especially in nodes requiring low-power mode with wake-up capability via the CAN bus. The ATA6562 is automotive Grade 0 qualified for an ambient temperature range from -40° to 150°C. To purchase the ATA6562 or obtain additional information, please contact any Microchip sales representative or authorized worldwide distributor.